Greece has been in the news constantly over the last eight years due to its sovereign debt crisis and the subsequent recession that has decimated the economy. 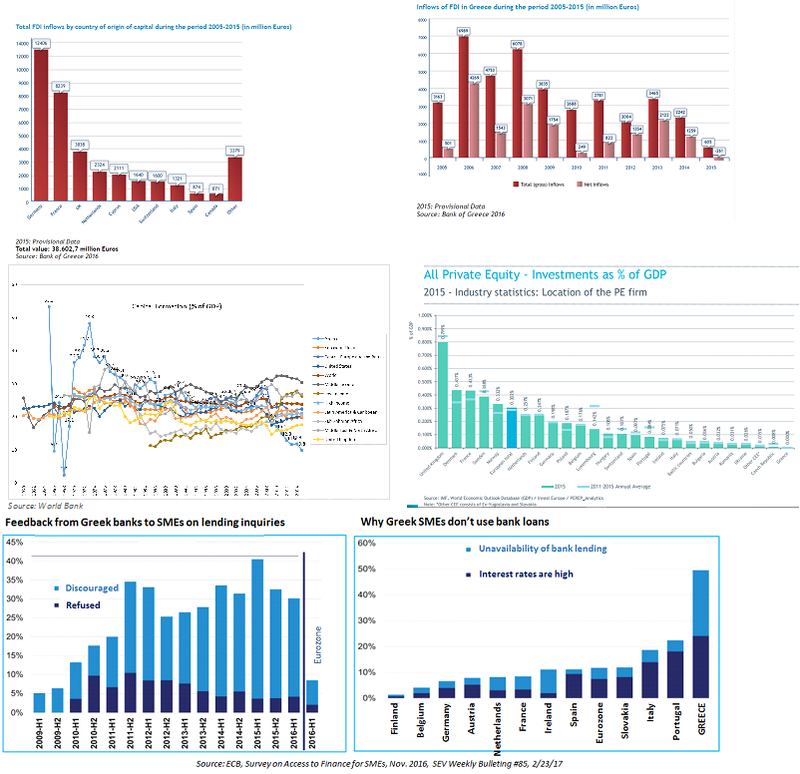 Most of the talk has been about the Greek economy’s prospects (40% of GPD lost since 2008 and is now at pre Euro levels), the sustainability of its government debt (175% of GDP) and the need for investment and growth that can put to work the 1 million unemployed Greeks (25% unemployment of which over 50% for youth) as well as reduce the brain drain (more than 400,000 have left since the beginning of the crisis, most of which highly educated). Many that are trying to explain the causes behind the problems of the Greek economy are pointing out to labor and public administration deficiencies and even expand to cultural traits. There is actually a book where many of these articles have been collected (“Greeks: Corrupted, Lazy and Disobedient” by Thomas Tsakalakis, (in Greek) 2016 and “The Greek Crisis in the Media: Stereotyping in the International Press” by George Tzogopoulos, 2013). 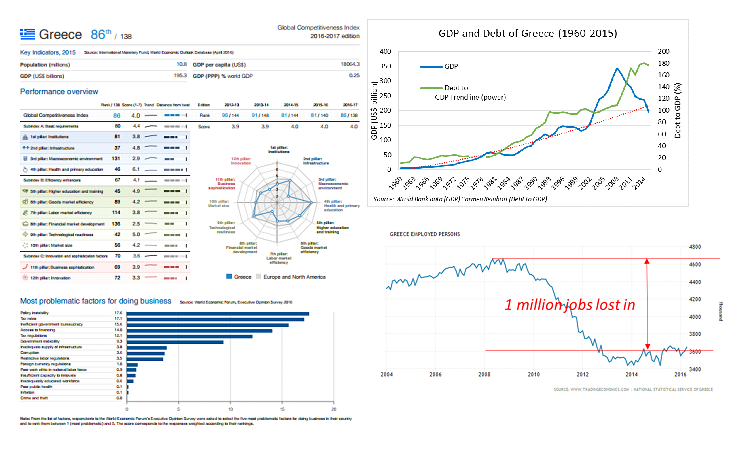 You would expect with all this negative talk that nothing is working in Greece. However Greece ranks 86th in World Economic Forum competitiveness ranking (down from 81st). It has comparable rankings to the European and North American average when it comes to health, education, infrastructure and lags in institutions, business sophistication and innovation as well as in sectors affected by the economic crisis ie the macroeconomic environment and financial markets (truth is economy mainly depending on banks that are now facing liquidity problems). On the other hand negative talk doesn’t offer a solution and often escalates into defamation, bigotry, defamation and stereotyping, no different to what you’d expect in a bar talk (ECOFIN president Dijsselbloem recently went as far as stating that Southern Europeans have spent their wealth on money and women (!!). Even if one can ignore the demoralizing aspects of this it’s difficult to ignore how it hurts investment. Which reputable investors wants to get involved in such a situation and have to justify to its shareholders? It’s when this talk becomes criminal as it affects peoples’ lives and prospects of economic reversal. At the same time it distracts investors’ attention and costs them opportunities. The purpose of this post is to examine the main argument behind this negative talk and discover how much is truth and how much pure fallacy. The posts will cover the arguments regarding Labor, Business Environment and overall Investment. Although it relates to Greece, the same analysis could apply in other economies. Overall conclusion: Who’d want to invest? How can you measure laziness? Lazy is somebody that’s not working. 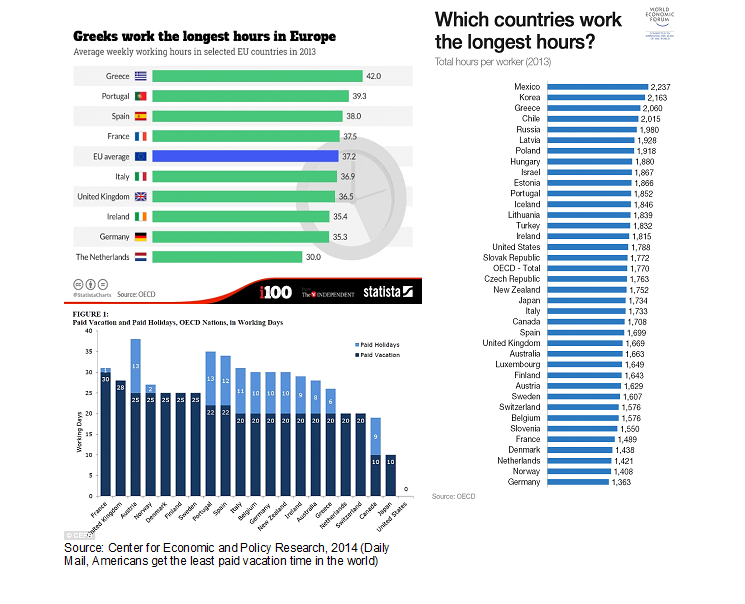 Greeks work the most hours among OECD or EU countries; 42 per week on average. The typical workweek in Greece is 40 hours (8 hours daily for 5 day workweek) but probably the 42 number is based on aggregate data (which is one of the highest globally too). Much of the low grading in the WEF Competitiveness analysis arise not from labor characteristics but by low productivity (this is due to low value added of output as discussed), as well as the quality of management (ie extend of reliance on professional management). 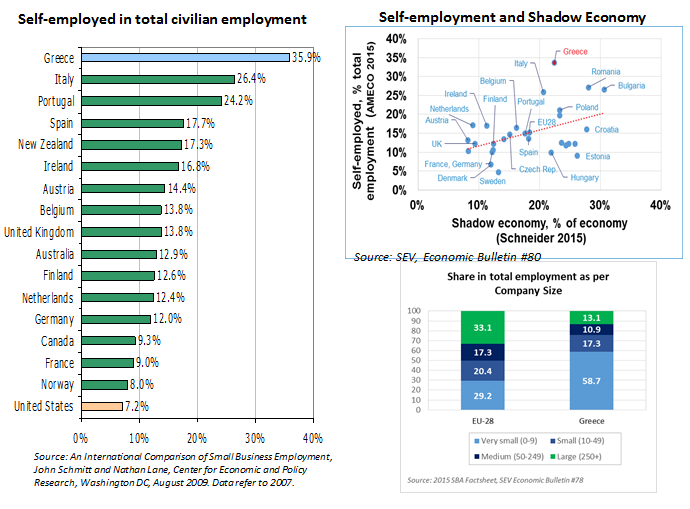 The latter can be attributed to the large number of small or family businesses (discussed under shadow economy) and can certainly be rectified with training, the utilization of recent graduates and ultimately by the rationalization and concentration of some of the activity in larger companies (refer to the shadow economy fallacy regarding size of businesses). Some might say that salaries in Greece are high. That depends on what you compare them too. Based on 2012 data Greece has one of the lowest salaries in the OECD. Since then wages in Greece have further decreased as a result of the crisis, GDP shrinking and spike in unemployment rates but also because of some regulatory action (decreasing the minimum wage, drop collective bargaining and other). According to IMF, there’s not a room for further decreases in salaries or disposable income (this has been affected as well through higher taxation). The economy and the people well-being is already too stretched. Furthermore continuous decreases will result in a vicious cycle of contraction with continuously decreasing consumption. On the other hand existing salary levels already constitute an attractive cost point for greenfield investments especially when combined by the fact that Greeks work many hours and are increasingly well educated. And of course besides all that Greece provides a base within the EU. To examine this fallacy we first have to define productivity. It’s quite unfortunate that productivity in public speech/common talk is related to how much work one gets done. However what the economists refer to in reality is probably a misnomer. In economic terms productivity represents the amount of goods and services produced in one hour of labor. This labor productivity is calculated as real gross domestic product (GDP) divided by total labor hours. That doesn’t say much. If you produce olive oil it doesn’t matter how fast you collect the crops, it’s about the selling price. If you produce gold watches or automobiles on the other hand you can allow yourself some breaks and still appear more productive, right? To be fiar labor productivity should probably be measured in the engineering way: ie how much output is achieved per labor hour but to do that one has to know a lot more information so this is not realistic. It is true that the (economic) labor productivity is low in Greece but why? That is because Greek GDP value added are low or working hours are too many. On the other hand, to raise the GDP and GDP per capita high-value output is needed (ie luxury/branded products, high tech etc). That’s a matter of planning and management decisions. High value added is related to branding (requires marketing expenditure) and technology (requires R&D expenditure) among others. And this cannot also be achieved overnight. Branding has worked quite well in tourism but Greece hasn’t done much to promote opportunities elsewhere. On the same time it lags in terms of R&D or manufacturing altogether. Greece can certainly increase R&D as it has a large number of PhDs and graduates (1,600 per year, similar to let’s say Israel), a lot of whom are forced to leave the country to work abroad. More than 400,000 Greeks have left Greece since the beginning of the crisis, most of them highly educated (a brain drain). A lot of them are also unemployed (20%) or underemployed. A tragedy and a waste of resources! 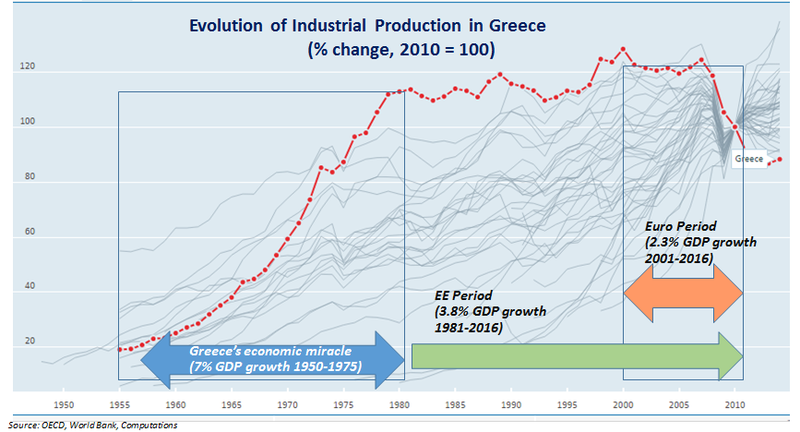 Know-how: Greece has not always been without manufacturing production. Between 1950-1975 manufacturing activity had increased exponentially and GDP at a 7% rate (it is widely accepted that manufacturing creates more value for an economy and better paid jobs than services. During this time Greece was producing electrical appliances, textiles, fast moving consumer goods even assembling automobiles! It’s since 1980 that manufacturing activity has stagnated and since 2005 dropped off the charts with many bankruptcies as well. Won’t expand on possible reasons for this or search for the culprits. 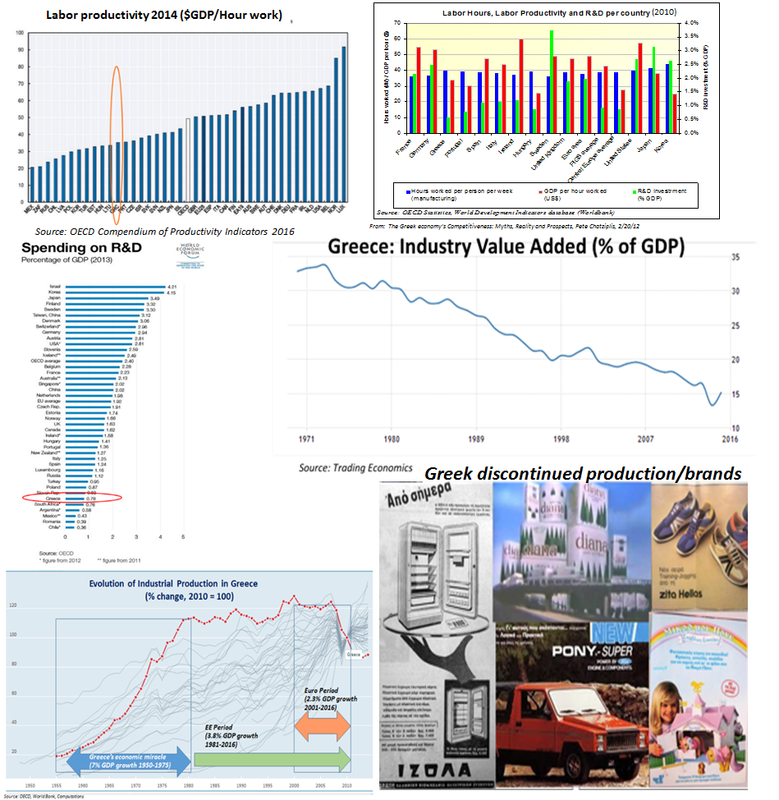 In any case Greece still has significant manufacturing abilities in shipbuilding, defense sector, mining, metallurgy, energy generation, construction, pharmaceuticals, agribusiness/food processing). R&D potential: Greek scientists are well respected and accomplished globally. According to Stamford’s Professor Ioannides (3% of global top researches is Greek, 85% of which live abroad). The Greek universities have respectable rankings according to the QS world university rankings six of them are among the world’s best. http://www.huffingtonpost.gr/2017/03/09/eidiseis-qs-koinwnia-paideia-panepisthmia_n_15259686.html. All these scientist could develop a global networks of distributed learning and R&D utilizing their local contacts as well. Finally, a frequent argument that Greece has small size and can’t develop the necessary economies of scale for competitive advantage in manufacturing can be easily countered by pointing out to same size economies but most importantly to recent technological advances. The production of the future (Manufacturing 4.0) is not be same as that of the past (without long labor and capital intensive production lines). It will be automated and enable small batch production locally vs large production lines of the past. It is estimated that in the near future most of repetitive manual tasks will be taken over by robots with mainly highly educated employees working in factories; in the UK alone it has been estimated that 57% of manufacturing jobs will be eliminated. Shadow economies exist in all countries. In Greece it is estimated at 24% of GDP; it is high but is actually not the highest in the EU or OECD (the respective averages are 19.7% and 17.6% respectively). As a comparison the US has a rather low number of 7% (probably the lowest globally) and on the other end Russia over 40%. The shadow economy results in uncollected taxes (referred to as tax-evasion). There are certain factors contributing to the creation of shadow activity such as fragmented business landscape as well as large number of transactions carried out in cash (hotels & restaurants, retails, transport). The latter has been reduced since the introduction of capital controls with more Greeks now using digital money. On the other hand Greece has an amazingly high number of self-employed professionals (gig economy, services, lawyers, accountants, consultants and other) as well as a higher proportion of small companies. Almost 35% of Greek labor force is self-employed compared to 7% in the US. On the other hand 58% of companies in Greece are very small (up to 9 employees) while the respective figure in the EU is 29%. It’s generally, difficult to collect taxes from these two sectors. The logistics are just incredible; it may not pay in terms of a cost/benefit analysis considering compliance and supervision expenses. That’s the same everywhere. 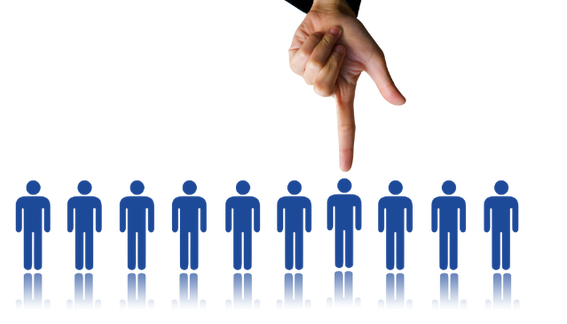 Small companies are crucial irrespective as they generate a large number of jobs. On the other end in other countries there enough large companies that, to the extent that they don’t use creative tax practices, can provide the funds necessary to run the governments (33% of companies are large in the EU (over 250 employees) compared to only 13% in Greece). Apart from that large companies can also invest in R&D and product and people development and move the needle for the whole economy and society the way that smaller companies can’t as they are usually barely surviving. Corruption in Greece: that’s a big topic that has been overly discussed, and the most often excuse for inactivity when it comes to investments (along with bureaucracy). Let’s see however how much of that is exaggeration and how corruption affects investment. Greece has better ranking in terms of corruption (CPI) compared to China (40), Mexico, Vietnam (33), Philippines (35), Peru (35), Bangladesh (26) etc. 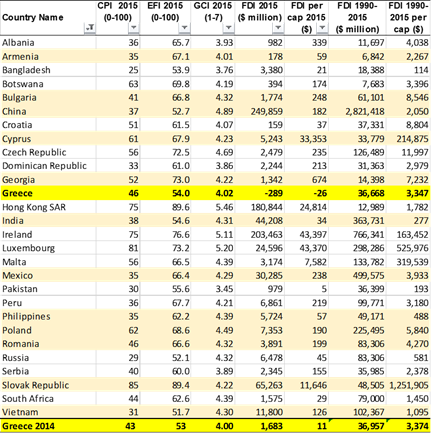 However these countries attract a higher level of Foreign Direct Investment (FDI) (see Table based on 2015 data). So at first sight the argument that corruption matters in investment doesn’t hold. Taking it a step further by running a regression analysis between CPI values and FDI in various countries the result come back indicating that there’s no real correlation. In case that you are aware of any other analytical data that support it, please let me know. Corruption is illegal, let’s not be misunderstood: USS’s FCPA guidelines have resulted in heavy fines to companies that use briberies to conduct business (for example Siemens and ongoing investigations for Novartis, Petrobras). However outside the moral question of legality, Bill Gates, in his $38 billion Gates Foundation 2014 annual letter, said that “corruption isn’t nearly the barrier to development that most people think it is” but kickbacks and bribes are “an inefficiency that amounts to a tax on aid”. Talking is branding: Even if corruption is not a deterrent for investment discussing about it creates a negative image for the Greek economy and eventually a vicious cycle and a self-fulfilling prophecy. Who want to be associated with corrupted practices? Therefore when coming to these issues the press should be very careful. Discussing corruption without proof might be irresponsible: the public often overreacts in corruption rumors and this can even lead to unrest, violence and hysteria (for example in cases that affect public health). Even if a system is “rigged” is it responsible to shake people’s trust in it without trying to correct it? Wouldn’t one be opening the Pandora’s Box by promoting mistrust? The definition of corruption and the public’s attitude towards it could also vary from one country to the other and this can involve cultural aspects too (we could refer to the work of Weber, Hofstede etc). For example individualistic cultures rely on written laws while collectivist on societal norms. When certain actions are not in accordance with written laws then this is corruption or criminal as per the individualistic cultures, however it might not appear as in a collectivist culture if it is in accordance with unwritten norms that for any reason are not reflected in the law. It’s a rather iconoclastic point of view but you may think about it. 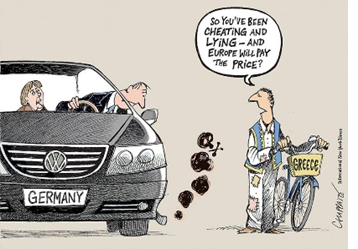 Does this mean that all the system in Germany or US is corrupted as the association fallacy in Greece’s case would imply? 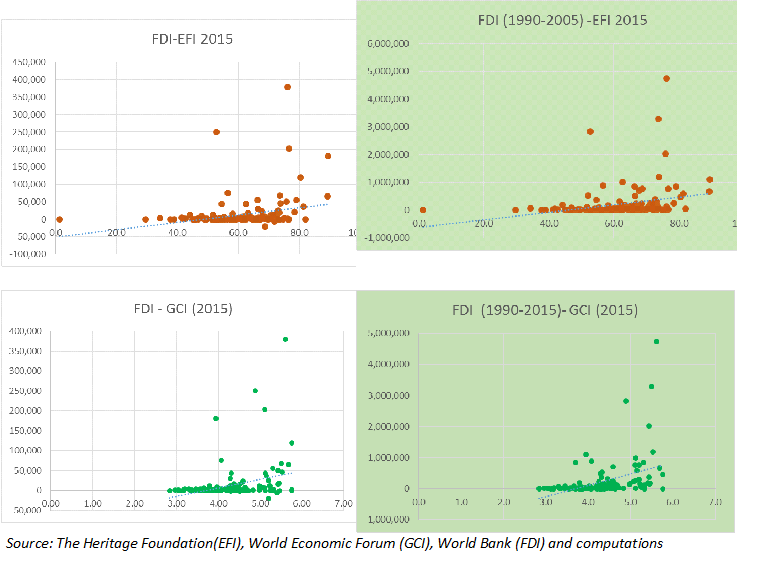 Running again a regression analysis between Foreign Direct Investment (FDI-World Bank) vs the EFI and GCI one could see whether there’s a connection between the two. This analysis comes back again indicating no significant/visible correlation! If somebody thinks different or if I am missing something I would be interested to know. Therefore the discussion of whether efficiencies affect investment is open to debate; one can’t decide other by looking on a case by case basis. Any other observations/opinions are welcome. The questions is whether Greece offers any of these features that attract investment. The answer is that it does or it may do as it will be covered in the next part. FIDI amounted to $1.7 billion in 2014 according to World Bank and 39.5 billion between 1990-2015; Top investors are from European countries (Germany, France, UK and Netherlands) ie western economies. 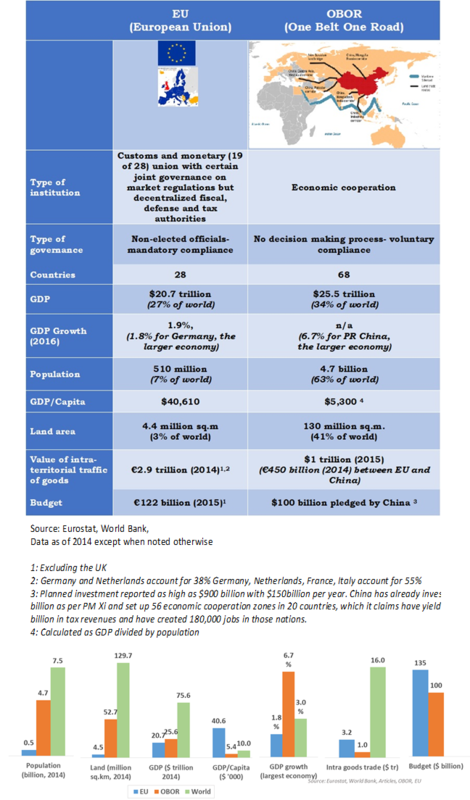 Geopolitics and distance may be a factor for European investment compared to the US that is not a major investor. Lately China is being investing heavily too as Greece through the Piraeus port is a critical part in the One Belt One Road initiative. There is luck of financing: the Greek banks are facing liquidity problems and operate under capital controls so they are giving loans sparingly. There are no other financing options (other from probably EU subsidies). The use of Private Equity or Venture Capital domestically is very low, if any, compared to western economies. Some foreign Private Equity funds have been quite active though. As indicated, investment is strong where there is a strong/proven case (ie tourism), strategic issues (ie logistics and Cosco) or fundamentals (telecom, airports). Apart from this the country needs, and in my opinion can support, investment in other value added sectors where the young more educated generation can be employed without having to move abroad. Tourism/Real Estate: large number of hotels houses at low prices that can be used for tourism purposes or even investment (such as trophy investment or new developments such as the Hellinikon project). Greece is a top 20 tourist destination. There are also new forms of tourism that can be developed that will expand the tourist season and target audience such as City Break tourism, food tourism (wine and other), experiential/alternative tourism. 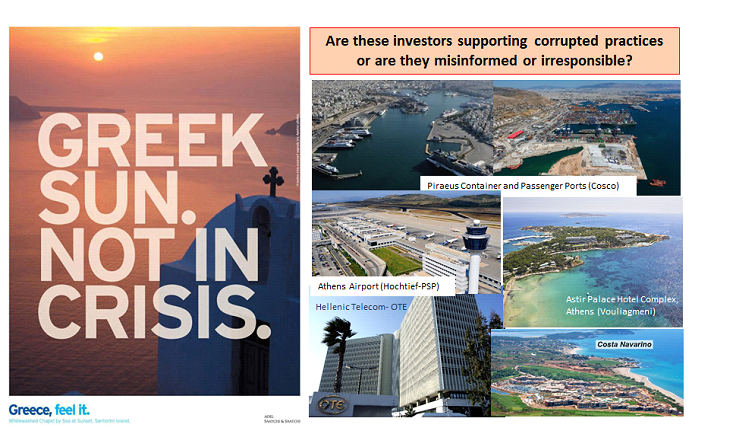 Infrastructure & Logistics: Greece can be a hub for transporting to Europe (China’s COSCO acquired the Piraeus port). The route from the East to Western Europe through the Suez Canal and Greece is faster by four days compared to following the Atlantic route. Furthermore the infrastructure of highways, railway, airports are being modernized (to be completed by 2017-18). The Piraeus port is part of China’s One Belt One Road initiative. Financial Services: large international investors (Paulson, Wilbur Ross, Fairfax) have invested in the Greek banking sector. Use of fintech applications are quite limited but expanding especially as the market is trying to find ways to operate around the capital controls imposed on use of cash and fund transfers. The Private Equity industry is also negligible and could be a source of financing while realizing significant returns in a not contested dealmaking space. Energy: there’s activity in conventional energy resources (a gas pipeline (TAP connecting Azerbaijani gas fields through Turkey to Italy) is under construction and others are under discussion (East Med), there’s offshore gas and oil exploration as well). Renewable energy accounts for 18% of energy consumption and has great potential although activity has come to a stall lately. The electricity market is being liberalized too. Agribusiness/food sector: the Mediterranean cuisine is increasing in popularity. There’s potential for exports; at the same time domestic consumption can absorb much of production as a large part of food products is imported. Furthermore there’s room for automation and intensification of production. Healthcare and Medical Tourism: there’s spare capacity in private sector hospitals as well as great human capital. Capacity can be utilized in medical tourism as well (IVF, dental, physiotherapy/spa among others). This is a service that hasn’t been developed yet. There are 6,000 doctors of Greek origin in the US only and many in Europe that could act as ambassadors. At least 18,000 Greek doctors have found work abroad since the beginning of the economic crisis. 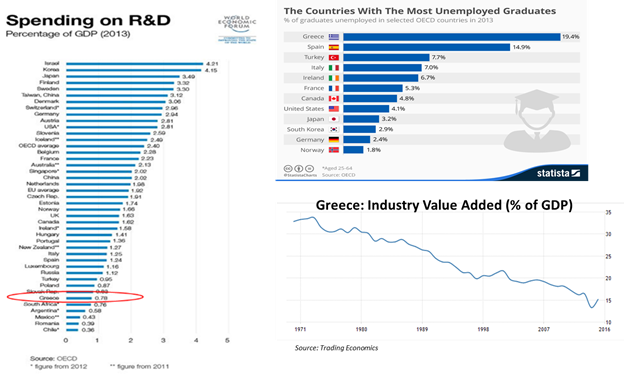 R&D and technology/manufacturing: as discussed there’s a large number of Greek PhDs in Greece and abroad and a large number of them are among the top researches. EBRD and the Greek state are sponsoring research programs to keep these scientists at home. At the same time salaries are low compared to other EU countries. Why not develop manufacturing facilities? As seen the modern production of tomorrow will not require large scale production or large labor force. Greece would not have to go through the adjustment phase but rather jump into the new high value added automated future right away. Note that large investment can now take advantage of fast track application procedures that have been lately put in place by the Greek state. Production could cover a wide array of products from fast moving consumer goods to household goods and high tech products as Greece is importing much of these goods not to mention that could also be used as an export base to the EU or other countries. Arts, culture and education: there’s a lot to say about cultural activities and education in Greece. Classical tourism hasn’t even been developed to the extend it could. Arts like filmmaking, apart from shooting revenues from can also create revenues indirectly through promoting the country for tourism or business activities (see such effect in New York City from the huge filming industry there). There may be more areas but I’m personally not very familiar/able to support the case but I’m open to research. In any case it is imperative to use advisors that are familiar with the investment environment and can navigate. Becoming making presumption based on investors’ own business environment, inconveniences from differences in legal system or culture or inability to tame bureaucracy can’t be a reason for failure. It’s just an excuse for those that are not prepared well. The difference between success and failure, between generating return or losing money depends on having a knowledgeable advisor to navigate through troubles. 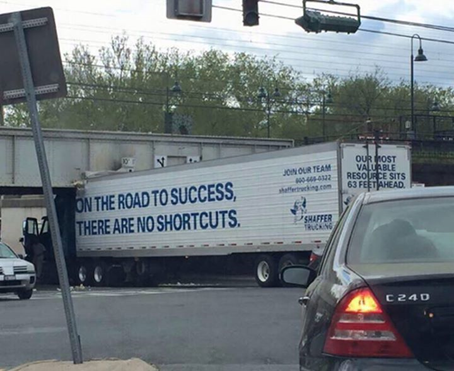 And in the end there are no shortcuts. If you don’t want to invest in advice and research you’ll have to live with the consequences…..
Θα περίμενε λοιπόν κάποιος που δεν έχει επαφή με την Ελλάδα και ακούει όλη αυτή την καταστροφολογία ότι τίποτα δεν λειτουργεί. Ωστόσο, η Ελλάδα κατατάσσεται στην 86η θέση στην λίστα ανταγωνιστικότητας του Παγκόσμιου Οικονομικού Φόρουμ (World Economic Forum) το 2017 (πέφτοντας από την 81η το 2016) σε σύνολο 137 χωρών που αξιολογήθηκαν και 193 διεθνώς. Έχει συγκρίσιμες βαθμολογίες με τον μέσο όρο της Ευρώπης και της Βόρειας Αμερικής όσον αφορά την υγεία, την εκπαίδευση, τις υποδομές και υστερεί σε θεσμούς, επιχειρηματικές πρακτικές και καινοτομία καθώς και σε τομείς που πλήττονται από την οικονομική κρίση, όπως το μακροοικονομικό περιβάλλον και τις χρηματοπιστωτικές αγορές. Δηλαδή η κατάταξη θα ήταν πολύ καλύτερη άμα υπήρχε ρευστότητα στην οικονομία!! Κάτι που επαφίεται σε άλλους..
Η αρνητική δημοσιότητα για την Ελλάδα όμως συνεχίζεται και επικεντρώνεται στην αναποτελεσματικότητα, τη διαφθορά τη γραφειοκρατία, τα εργατικά θέματα, τη νομοθεσία, τη φοροδιαφυγή και εν τέλει την Ελληνική νοοτροπία. Ως απόδειξη έχουν γραφτεί και βιβλία με τα άρθρα που έχουν συλλεχθεί από τον διεθνή τύπο («Έλληνες: Διεφθαρμένοι, Τεμπέληδες και Απείθαρχοι: Στερεότυπα του Βρετανικού τύπου για τους Έλληνες στα Χρόνια της Κρίσης» Θωμάς Τσακαλάκης, 2016 και «Η Ελληνική Κρίση στα Μέσα Ενημέρωσης: Στερεότυπα στον Διεθνή Τύπο» (The Greek Crisis in the Media: Stereotyping in the International Press), Γιώργος Τζογόπουλους 2013). Πολλές φορές τα άρθρα αυτά είναι άδικα, υποτιμητικά, υπερβολικά, ίσως κατευθυνόμενα και εν τέλει καταστρεπτικά. Είναι απορίας άξιο πως οι πρωτοπόροι της πολιτικής ορθότητας (political correctness) στη Δύση οι οποίοι πλέον δεν μπορούν ούτε ανέκδοτο να πούνε για εθνότητες χωρίς να στοχοποιηθούν ως ρατσιστές, ανερυθρίαστα λένε τόσα αρνητικά για τους Έλληνες και πολλοί δυστυχώς τα ανέχονται και σε ορισμένες περιπτώσεις επικροτούν χωρίς τουλάχιστον κάποια έρευνα. Φτάσαμε στο σημείο ο πρόεδρος του ECOFIN Νταισελμπλουμ να πει ότι οι Νότιοι Ευρωπαίοι έχουν ξοδέψει τα χρήματά τους σε ποτά και γυναίκες οπότε δεν μπορούν μετά να ζητάν την Ευρωπαϊκή αλληλεγγύη!!!! Τέτοια απλούστευση και προκατάλλειψη μόνο σε συζήτηση καφενείου θα μπορούσε να ειπωθεί και όχι από έναν υψηλά ιστάμενο. Αλλά και να ήθελε να κάνει μια αναφορά στις σπατάλες των τελευταίων χρόνων παρέλειψε να αναφερθεί και στα λεφτά που χορήγησαν Ευρωπαϊκές τράπεζες και εν συνεχεία ξοδεύτηκαν σε εισαγόμενα από την Ευρώπη αυτοκίνητα και καταναλωτικά αγαθά ή διακοπές εκεί με τα περίφημα διακοποδάνεια!). Βέβαια αυτό είναι αντικείμενο για άλλη συζήτηση. Όλα αυτά βέβαια έχουν δημιουργήσει μεγάλη δυσπιστία και από τις δυο πλευρές, της Ελλάδας καθώς και της υπόλοιπης Ευρώπης. Έχουν ενδεχομένως εξάψει παλαιότερες προκαταλήψεις με αποτέλεσμα η αρνητική ψυχολογία να θέτει σε κίνδυνο την Ευρωπαϊκή ιδέα και την προοπτική λύσης. Το θέμα αυτής της αρνητικής δημοσιότητας είναι πολύ σημαντικό ειδικά στο εξωτερικό όπου το κοινό δεν έχει άμεση επαφή με την πραγματικότητα με αποτέλεσμα να φέρνει σε άσχημη θέση τους ομογενείς αλλά και όλους αυτούς που προσπαθούν να δραστηριοποιηθούν στην Ελλάδα ή να προσελκύσουν επενδύσεις. Πολλά από αυτά τα έχουμε αντιληφθεί και μέσω σχολίων από τουρίστες. Το άρθρο αυτό γράφτηκε αρχικά για αυτό το κοινό αφού ο γράφων ζει εδώ και πολλά χρόνια στο εξωτερικό. Μπορεί όμως να παρέχει τα «πολεμοφόδια» στον κάθε πατριώτη ώστε να κρίνει από μόνος και να αντικρούσει την προπαγάνδα που μεταδίδεται από τα διάφορα ΜΜΕ αλλά και από άλλους κακοπροαίρετους ή παραπληροφορημένους συμπολίτες. Βλέπετε, συχνά το κοινό που δεν έχει τις γνώσεις ή το χρόνο να τα αναλύσει τα δέχεται όλα αυτά παθητικά και σε αυτό ποντάρουν οι διάφοροι «ειδήμονες» των ΜΜΕ. Εν τέλει το άρθρο αποσκοπεί στην υπεράσπιση της Ελληνικής τιμής και της κοινωνίας χωρίς όμως και να θέλει να εξωραΐσει ή να προσφέρει άφεση αμαρτιών. Ταυτόχρονα όμως αποσκοπεί να παρέχει και μια πιο σφαιρική άποψη σε επενδυτές ώστε να μην απέχουν από καλές επιχειρηματικές προτάσεις οι οποίες καταλήγουν σε αετονύχηδες. Ίσως και αυτός να είναι ένας από τους σκοπούς που γίνεται. Από την άλλη βέβαια υπάρχουν και πολλοί οι οποίοι δεν επενδύουν απλά επειδή δεν θέλουν ή δεν μπορούν δηλαδή δεν έχουν τα λεφτά, τις γνώσεις ή τον χρόνο. Όποιος δε θέλει να ζυμώσει πέντε μέρες κοσκινάει… Δεν θα πρέπει όμως να κρύβονται πίσω από δικαιολογίες και να επηρεάζουν και άλλους. Για να γίνει μια επένδυση χρειάζεται υποστήριξη από συμβούλους που έχουν καλές γνώσεις της πραγματικότητας. Αν π.χ. κάποιος έχει τη φαεινή ιδέα να αγοράσει ένα κεντρικό οικόπεδο μιας πόλης και να κάνει ουρανοξύστη και εμπορικό κέντρο ή εργοστάσιο σε μια παραλία σίγουρα θα βρει αντιδράσεις. Ακόμα και στο Μανχάταν της Νέας Υόρκης που είναι γεμάτο ουρανοξύστες υπάρχει αντίδραση σε χτίσιμο νέων οικοδομών γιατί υποστηρίζουν ότι ρίχνουν σκιά στην υπόλοιπη πόλη. Γιατί όμως κάποιοι εξανίστανται σε αυτές τις περιπτώσεις; Μήπως γιατί προσπαθούν να υπερκεράσουν τους νόμους; Ας είμαστε λίγο κριτικοί σε αυτές τις κραυγές. Μη ξεχνάμε ότι οι μεγάλοι επενδυτές πάντα έχουν εταιρίες δημόσιων σχέσεων δουλειά των οποίων είναι να καταχωρούν άρθρα στα ΜΜΕ. Για αυτό είναι χρήσιμο να εξετάσουμε όλα αυτά τα παράπονα. Κανένας λογικός άνθρωπος δε θέλει να επενδύσει στην Ελλάδα..
Πώς μπορεί να καταγραφεί η τεμπελιά με νούμερα; Τεμπέλης είναι κάποιος που δε δουλεύει. Οι Έλληνες εργάζονται τις περισσότερες ώρες μεταξύ των χωρών του ΟΟΣΑ και των χωρών της ΕΕ: κατά μέσο όρο 42 ώρες εβδομαδιαίως σύμφωνα με συγκεντρωτικά στοιχεία επί της συνολικής απασχόλησης. Μάλιστα όσο αφορά τις συνολικές ώρες εργασίας οι Έλληνες τοποθετούνται στις κορυφαίες θέσεις και διεθνώς. Είναι επίσης σύνηθες να δουλεύουν δύο ή περισσότερες δουλειές και μερικές φορές κάποιο μέρος αυτής της εργασίας δεν απεικονίζεται στα επίσημα στοιχεία λόγω της παραοικονομίας. Συνεπώς μπορεί το νούμερο να είναι και μεγαλύτερο. Ένας ακόμα λόγος για αυτό το υψηλό νούμερο είναι και η μικρότερης διάρκεια άδειας στην Ελλάδα (τέσσερις εβδομάδες το χρόνο όταν στην Αυστρία και στη Δανία δίνονται πέντε). Φυσικά αυτό που θα πούνε κάποιοι είναι τι σημασία έχει το πόσες ώρες είναι κάποιος στη δουλειά άμα δεν κάνει κάτι? Μα αυτό εξαρτάται από την δουλειά που του δίνεται και θα αναλυθεί στην πλάνη για την παραγωγικότητα παρακάτω. Για την ώρα όμως κανένας δεν μπορεί να πει ότι οι Έλληνες είναι τεμπέληδες και τουλάχιστον για τους πολλούς Έλληνες όπου έχουν μεταναστεύσει στο εξωτερικό δεν υπάρχει τέτοια κατηγορία, το αντίθετο μάλιστα. Συχνά ακούγονται παράπονα ότι τα συνδικάτα στην Ελλάδα είναι μη συνεργάσιμα και ότι ο εργατικός νόμος είναι άκαμπτος. Κατ’αρχας η Ελλάδα έχει ένα εργατικό καθεστώς το οποίο ακολουθεί τα δεδομένα της ηπειρωτικής Ευρώπης που διακρίνονται για τις κοινωνικές ευαισθησίες τους και σε αυτό το πλαίσιο είναι σίγουρα πιο φιλεργατικό από το αγγλοσαξονικό/ατομικιστικό (individualist) σύστημα της Αμερικής (όπου και εκεί όμως υπάρχουν συνδικάτα) ή της Ασίας. Το εργατικό πλαίσιο της Ελλάδας χαλάρωσε επίσης πρόσφατα με τις μεταρρυθμίσεις που πραγματοποιούνται κάτω από τις απαιτήσεις της Τρόικας. Σύμφωνα με στοιχεία αλλά και με εμπειρίες του υπογράφοντα το πλαίσιο αυτό είναι ελαστικότερο από αυτό άλλων χώρων της Ευρωπαϊκής Ένωσης οι οποίες όμως έχουν υψηλότερους απολαβές και απασχόληση (όπως πχ η Γερμανία). Είναι π.χ. σύνηθες σε πολλές Ευρωπαϊκές χώρες να είναι δύσκολες ή αδύνατες οι ομαδικές απολύσεις. Το εργατικό πλαίσιο μπορεί να καταγραφεί από τον Δείκτη Νομοθεσίας για την Προστασία της Απασχόλησης- Employment Protection Legislation-ELP Index) του ΟΟΣΑ καθώς και από τον Δείκτη Ανταγωνιστικότητας της Εργασίας ((Labor Competitiveness Index) του Παγκόσμιου Οικονομικού Φόρουμ. Η τιμή του δείκτη ELP για την Ελλάδα όσο αφορά την πλήρη απασχόληση είναι 2,4 η οποία είναι χαμηλότερη από αυτόν των αναπτυγμένων δυτικών οικονομιών (πχ για την Γερμανία είναι 3) και παρόμοιος με αυτόν της Αναδυόμενης/Ανατολικής Ευρώπης (π.χ. Πολωνία 2,4, Τσεχία 2,7). Συνεπώς η κατάσταση είναι συγκρίσιμη ή και καλύτερη της υπόλοιπής Ευρώπης. Επίσης όπως και με την ανταγωνιστικότητα, η χαμηλή βαθμολογία δεν οφείλεται στα εργατικά δεδομένα αλλά στη χαμηλή παραγωγικότητα (δηλαδή στη χαμηλή προστιθέμενη αξία της παραγωγής που θα αναλυθεί παρακάτω) καθώς και στην ποιότητα της διοίκησης, δηλαδή λείπουν τα στελέχη με υψηλή κατάρτιση όπως πχ σε κάποιες μικρές και οικογενειακές επιχειρήσεις . Αυτοί είναι εξωγενείς παράγοντες από το θεσμικό πλαίσιο και τους εργαζόμενους άρα κάτι που εναπόκειται στους επενδυτές για να βελτιώσουν. Κάποιοι μπορεί να λένε ότι οι μισθοί στην Ελλάδα είναι υψηλοί. Αυτό εξαρτάται από το με τι συγκρίνονται. Αν συγκρίνονται με κάποιες αναπτυσσόμενες χώρες της Ασίας με χαμηλότερο βιοτικό επίπεδο ίσως να είναι. Αν συγκρίνονται με την Ευρώπη δεν είναι. Το θέμα είναι που τοποθετείται κανείς, ποιους ανταγωνίζεται και που θέλει να φτάσει. Με βάση τα δεδομένα του 2012 η Ελλάδα έχει από τους χαμηλότερους μισθούς στον ΟΟΣΑ. Από τότε δε οι μισθοί μειώθηκαν περαιτέρω. Μειώθηκαν ως αποτέλεσμα της ανεργίας, της μείωσης της κατά κεφαλή δαπάνης, την υποαπασχόληση(για να μη μιλήσουμε για την μη καταβολή μισθών) αλλά και λόγω νομοθετικών ενεργειών (μείωση του κατώτατου μισθού, έλλειψη συλλογικών διαπραγματεύσεων κ.λπ.). Κατά το ΔΝΤ, δεν υπάρχει περιθώριο για περαιτέρω μειώσεις των μισθών ή του διαθέσιμου εισοδήματος (αυτό έχει μειωθεί επίσης από την υψηλή φορολογία). Τα ποσοστά φτώχιας έχουν αυξηθεί και η κοινωνία είναι σε οριακό σημείο. Επιπλέον, οι συνεχείς μειώσεις θα έχουν ως αποτέλεσμα έναν φαύλο κύκλο ύφεσης με τη συνεχή μείωση της κατανάλωσης και άρα των εσόδων για επιχειρήσεις λιανικής. Αναφερόμαστε δηλαδή στη συζήτηση για τους μισθούς στο Δημόσιο, απουσία άλλων δυνατοτήτων απασχόλησης (και χωρίς να παρεξηγηθούμε ως κρατικιστές). 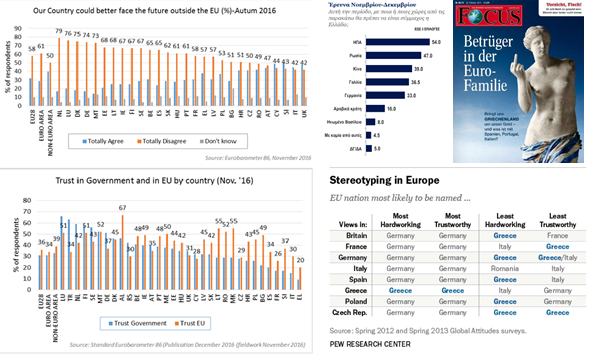 Για να μην μιλήσουμε και για το Brain Drain (δηλαδή την φυγή των διπλωματούχων σε υψηλότερες αποδοχές τους εξωτερικού) και τη γενικότερη μετανάστευση η οποία στερεί εργατικούς πόρους αλλά και το μέλλον της χώρας μέσω της απώλειας ενεργού πληθυσμού και ασφαλιστικών εισφορών. Είναι επίσης μια απώλεια της εκπαιδευτικής δαπάνη που έχει καταβληθεί για τα άτομα αυτά τόσο από το κράτος μέσω της δωρεάν παιδείας όσο και από τις οικογένειές μέσω της εξωσχολικής παιδείας, για να μην επεκταθούμε στο ανθρώπινο μέρος. Για να εξετάσουμε αυτήν την πλάνη πρέπει πρώτα να καθορίσουμε τι εννοούμε παραγωγικότητα. Είναι ατυχές πραγματικά το ότι το μέγεθος αυτό χρησιμοποιείται λανθασμένα. Παραγωγικότητα στη κοινή λογική σχετίζεται με το πόση εργασία/προϊόν παράγεται από έναν εργαζόμενο σε συγκεκριμένο χρόνο. Αυτό δεν είναι εύκολο να μετρηθεί στο σύνολο της οικονομίας παρά μόνο σε μια επιχείρηση οπότε αναφερόμαστε στην παραγωγικότητα όπως την εννοούν οι μηχανικοί. Αυτό που οι οικονομολόγοι ή οι πολιτικοί εννοούν όταν αναφέρονται στην παραγωγικότητα είναι το κλάσμα του ακαθάριστου εγχώριου προϊόντος (ΑΕΠ) ως προς τις συνολικές ώρες εργασίας. Αυτό δεν λέει πολλά. Εάν παράγετε ελαιόλαδο δεν έχει σημασία πόσο γρήγορα μαζεύετε τις ελιές η σκαλίζετε γιατί αυτός που παράγει πιο ακριβά προϊόντα όπως π.χ. αυτοκίνητα θα παράξει στον ίδιο χρόνο κάτι που θα αποφέρει υψηλότερο έσοδο το οποίο είναι και αυτό που καταγράφεται στο ΑΕΠ. Είναι λοιπόν αλήθεια ότι η (οικονομική) παραγωγικότητα εργασίας όπως μετράται από το αυτό το κλάσμα είναι χαμηλή. Ακόμα πιο ενδιαφέρον ότι μετά από οκτώ χρόνια κρίσης και τόσων μεταρρυθμίσεων η παραγωγικότητα έχει πέσει και κατά τα λεγόμενα των πολιτικών χρειάζονται ακόμα περισσότερες…. Η στραβός είναι ο γιαλός ή στραβά αρμενίζουμε… Αλλά γιατί; Με βάση τα μαθηματικά και μόνο αυτό μπορεί να συμβαίνει επειδή είτε η προστιθέμενη αξία στο ελληνικό ΑΕΠ είναι χαμηλή είτε οι ώρες εργασίας είναι πάρα πολλές. Από την άλλη πλευρά, η αύξηση του ΑΕΠ απαιτεί παραγωγή υψηλής αξίας (π.χ. προϊόντα πολυτέλειας, επώνυμα και υψηλής τεχνολογίας). Αυτό είναι θέμα επιχειρηματικής στρατηγικής, αν και μπορεί να επηρεάζεται και από τις δεξιότητες του προσωπικού. Η υψηλή προστιθέμενη αξία όμως απαιτεί και σημαντικές επενδύσεις σε διαφήμιση (branding και marketing), τεχνολογία (δηλαδή Έρευνα και Ανάπτυξη E&A (Research &Development – R&D)) και εκπαίδευση προσωπικού μεταξύ άλλων. Αυτό δεν μπορεί να συμβεί από τη μια στιγμή στην άλλη. Η Ελλάδα μπορεί να είναι γνωστή για τον τουρισμό, το οποίο ίσως να έχει γίνει και τυχαία, αλλά είναι πολύ δύσκολο να συμβεί για άλλα προϊόντα όπως πχ τεχνολογίας όπου δεν υπάρχει παράδοση και αντιμετωπίζει και μεγάλο ανταγωνισμό. Την ίδια στιγμή η Ελλάδα υστερεί σε επίπεδο Έρευνας και Ανάπτυξης (Ε&Α) ή και μεταποίησης. Η δαπάνη για Ε&Α ανέρχεται σε 0.8% του ΑΕΠ σε σχέση με 4.2% στο Ισραήλ, 2.8% στις ΗΠΑ, 2% στην Κίνα και 1.9% στον μέσο όρο της ΕΕ. Στις ΗΠΑ και αλλού μεγάλο μέρος της δαπάνης καλύπτουν επίσης ιδιωτικά κεφάλαια και μεγάλες εταιρίες που δεν υπάρχουν στην Ελλάδα. Αυτά είναι τα λεγόμενα startup τα περισσότερα από τα οποία αποτυγχάνουν αλλά εν τω μεταξύ έχουν απασχολήσει κόσμο και συνολικά έχουν παράξει αξία (καλή είναι η έρευνα αλλά μέχρι να αποδώσει κάποιος πρέπει να πληρώνει το νοίκι και το φαγητό….). Για όλα αυτά χρειάζονται κεφάλαια. Δυνατότητα Ε & Α: η Ελλάδα διαθέτει μεγάλο αριθμό πτυχιούχων και κατόχων διδακτορικών πολλοί από τους οποίους αναγκάζονται να εγκαταλείψουν τη χώρα για να εργαστούν στο εξωτερικό. Περισσότεροι από 400.000 Έλληνες έχουν εγκαταλείψει την Ελλάδα από την αρχή της κρίσης, οι περισσότεροι από τους οποίους είναι μορφωμένοι (το λεγόμενο Brain Drain). Πολλοί από αυτούς που μένουν στην Ελλάδα είναι άνεργοι (20%) ή υποαπασχολούμενοι. Οι Έλληνες επιστήμονες είναι σεβαστοί και επιτυχημένοι παγκοσμίως. Σύμφωνα με τον Καθηγητή Ιωαννίδη του περίφημου Πανεπιστημίου Stamford της Καλιφόρνιας το 3% των κορυφαίων ερευνητών παγκοσμίως είναι Έλληνες, το 85% των οποίων ζει στο εξωτερικό. Παρά την καταστροφολογία τα Ελληνικά πανεπιστήμια έχουν επίσης αξιοσέβαστη κατάταξη σύμφωνα με την παγκόσμια βαθμολογία πανεπιστημίων QS, έξι από αυτά είναι μεταξύ των καλύτερων στον κόσμο. Κι αν οι κατατάξεις δεν φτάνουν μπορεί κανείς να δει πόσοι απόφοιτοι των Ελληνικών πανεπιστημίων είναι σε περίοπτες θέσεις στο εξωτερικό. Όλοι αυτοί θα μπορούσαν να αναπτύξουν ένα παγκόσμιο δίκτυο επιστημονικής συνεργασίας με συναδέλφους τους στην Ελλάδα δρώντας ως συνδετικός κρίκος με τις τοπικές τους ερευνητικές κοινότητες ώστε να πολλαπλασιαστούν οι δυνατότητες Ε&Α στην Ελλάδα. Τεχνογνωσία: Η Ελλάδα δεν ήταν πάντα χωρίς μεταποιητική παραγωγή αλλά ακόμα και τώρα έχει σημαντική τεχνογνωσία σε ορισμένους τομείς. Μεταξύ 1950-1975 η παραγωγική δραστηριότητα αυξήθηκε εκθετικά συμπαρασύροντας σε αύξηση και το ΑΕΠ με ρυθμούς 7% (είναι ευρέως αποδεκτό ότι η μεταποίηση δημιουργεί περισσότερη αξία για μια οικονομία και καλύτερα αμειβόμενες θέσεις εργασίας από τις υπηρεσίες). Κατά τη διάρκεια αυτής της περιόδου η Ελλάδα παρήγαγε ηλεκτρικές συσκευές, υφάσματα και ρούχα, καταναλωτικά αγαθά, ακόμη και αυτοκίνητα! Μερικοί ίσως θυμούνται επιχειρήσεις όπως η αυτοκινητοβιομηχανίες Namco(Pony) και Teokar (Nissan), το πρώτο ηλεκτρικό αυτοκίνητο Enfield8000 που κατασκευάστηκε στο Νεώριο Σύρου, τα Zita Hellas, χαρτοβιομηχανίες Softex και Diana, τα παιχνίδια ElGreco, τις συσκευές Ιzola και Pitsos (συνεχίζουν να υπάρχουν ως επωνυμίες αν και με αβέβαιο μέλλον) ακόμα και πολυεθνικές που παρήγαγαν φάρμακα και άλλα προϊόντα στην Ελλάδα. Από το 1980 όμως, με την είσοδο στην ΕΕ χωρίς να θέλουμε να επεκταθούμε εδώ και χωρίς να είναι ο μόνος λόγος, η μεταποιητική δραστηριότητα άρχισε να κάμπτεται. Τότε εμφανίστηκε και η καταστρεπτική, ανεύθυνη ρήση ότι «ο τουρισμός είναι η βαριά βιομηχανία της Ελλάδας….» Από το 2005 και μετά η παραγωγή κατακρημνίστηκε λόγω και της κρίσης και έχουμε και πολλές χρεοκοπίες. Σε κάθε περίπτωση η Ελλάδα εξακολουθεί να έχει σημαντικές ικανότητες και προοπτικές στις κατασκευές, στη ναυπηγική, τον αμυντικό τομέα, τη μεταλλουργία, στην παραγωγή ενέργειας, τη φαρμακοβιομηχανία, την αγροτοβιομηχανία και μεταποίηση τροφίμων. Και φυσικά υπάρχουν και τόσοι Έλληνες που δουλεύουν σε βιομηχανίες στο εξωτερικό. Μέγεθος αγοράς: Το συνηθισμένο επιχείρημα ότι η Ελλάδα έχει μικρό μέγεθος και δεν μπορεί να αναπτύξει τις απαραίτητες οικονομίες κλίμακας στον τομέα της μεταποίησης, μπορεί εύκολα να αποκρουστεί αν κοιτάξουμε χώρες του ίδιου μεγέθους οι οποίες παράγουν (πχ Τσεχία). Κυρίως όμως, με τις τεχνολογικές εξελίξεις η παραγωγή του μέλλοντος κατά τη λεγόμενη τέταρτη βιομηχανική επανάσταση (Manufacturing0) δεν θα είναι ίδια με εκείνη του παρελθόντος. Θα είναι αυτοματοποιημένη και θα επιτρέπει την μικρού μεγέθους τοπική παραγωγή σε αντίθεση με τα μεγάλα εργοστάσια του παρελθόντος. Εκτιμάται ότι στο κοντινό μέλλον οι περισσότερες χειρωνακτικές εργασίες θα αναληφθούν από ρομπότ και οι υπάλληλοι θα είναι υψηλότερου μορφωτικού επιπέδου για να τα διαχειριστούν. Στο Ηνωμένο Βασίλειο π.χ. εκτιμάται ότι το 57% των θέσεων εργασίας στον τομέα της μεταποίησης θα εξαλειφθεί στο κοντινό μέλλον λόγω αυτοματοποίησης. Τέλος η πτώση της παραγωγικότητας έχει πέσει γιατί απλά έχει μειωθεί ο αριθμητής του κλάσματος, δηλ. το ΑΕΠ. Μήπως θα πρέπει να σκεφτούμε μια πορεία αύξησης του ΑΕΠ με τόνωση της εγχώριας παραγωγής με υποκατάσταση πολλών εισαγομένων προϊόντων από τοπικά παραγόμενα και συσσώρευση κεφαλαίου και τεχνογνωσίας; Η Ελλάδα εισάγει εκτός από πετρέλαιο και προϊόντα υψηλής τεχνολογίας ακόμα και αγροτοκτηνοτροφικά προϊόντα. Η τοπική παραγωγή θα συνέτεινε στην αύξηση του ΑΕΠ. Αλλά κάτι τέτοιο θα απαιτούσε ενδεχομένως και μια προσπάθεια προστασίας της δραστηριότητας αυτής τουλάχιστον στα αρχικά στάδια κάτι που ίσως δεν είναι δυνατό στο παρόν Ευρωπαϊκό πλαίσιο. Αλλά είναι μια σκέψη για μια άλλη ανάλυση. Υπάρχουν πολλά άρθρα σχετικά με την απροθυμία των Ελλήνων να πληρώνουν φόρους και τα τεχνάσματα που βρίσκουν για να τους αποφεύγουν σαν να είναι ένα μοναδικό φαινόμενο διεθνώς (ας μην επεκταθούμε εδώ σε πρακτικές των πολυεθνικών και τα ιδιωτικά κεφάλαια σε φορολογικούς παραδείσους που αποκαλύπτονται κάθε μέρα). Ενδεικτικά ο διευθύνων σύμβουλος της Pfizer, Ian Read είχε πει πρόσφατα ότι είναι καθήκον ενός διευθυντικού στελέχους ως προς τους μετόχους να βρίσκει τρόπους να μειώνει τους φόρους. Αυτό φυσικά γίνεται και με τη βοήθεια διάσημων συμβουλευτικών εταιρειών (φοροτεχνικοί, νομικοί κλπ). Το συνολικό φορολογικό εισόδημα της Ελλάδας αντιπροσωπεύει το 33% του ΑΕΠ, το οποίο είναι παρόμοιο με το μέσο όρο του ΟΟΣΑ. Επομένως, δεν εμφανίζεται κάποια ιδιαιτερότητα (διαφορές υπάρχουν ως προς το εάν οι φόροι είναι άμεσοι ή έμμεσοι το οποίο δημιουργεί και κάποια κοινωνική αδικία). Ωστόσο, κάποιοι μπορεί να λένε ότι η φοροδιαφυγή προέρχεται από το μη δηλωμένο εισόδημα κυρίως των μικρών επιχειρήσεων και των ελεύθερων επαγγελματιών (αυτό αναλύεται στην πλάνη περί παραοικονομίας). Τώρα όσο αφορά στους φόρους των εφοπλιστών για τους οποίους η ΕΕ/ΔΝΤ έχουν ζητήσει αύξηση, κάποιος θα μπορούσε να πει ότι οι εφοπλιστικές εταιρίες είναι δύσκολο να φορολογηθούν λόγω του πολύπλοκου νομικού τους καθεστώτος που ξεφεύγει της εθνικής δικαιοδοσίας (θα μπορούσαμε να πούμε ότι είναι από τις πρώτες διδάξασες πολυεθνικές οι οποίες είναι δύσκολο να φορολογηθούν χωρίς συντονισμό μεταξύ κρατών). Από την άλλη όμως θα μπορούσε και να είναι δυνατή η προνομιούχα φορολογική μεταχείριση σε έναν κλάδο (στο βαθμό που κάποια χώρα έχει ανεξάρτητη πολιτική) αν αυτός ο κλάδος μπορεί να παρέχει με άλλο τρόπο στην οικονομία (π.χ θέσεις εργασίας ή επενδύσεις). Παραοικονομία υπάρχει σε όλες τις χώρες. Η παραοικονομία συνήθως θεωρείται πρόβλημα επειδή οδηγεί σε μη εισπραχθέντες φόρους (δηλαδή φοροδιαφυγή) και ανισότητα. Στην Ελλάδα υπολογίζεται στο 24% του ΑΕΠ (δηλαδή αυτή είναι η οικονομική δραστηριότητα που δεν απεικονίζεται επίσημα). Το ποσοστό αυτό είναι υψηλό αλλά στην πραγματικότητα δεν είναι το υψηλότερο στην ΕΕ ή τον ΟΟΣΑ (οι αντίστοιχοι μέσοι όροι είναι 19,7% και 17,6% αντίστοιχα). Συγκριτικά, οι ΗΠΑ έχουν μάλλον χαμηλή παραοικονομία της τάξης του 7% (πιθανότατα το χαμηλότερο σε παγκόσμιο επίπεδο) και από την άλλη μεριά τη Βραζιλία και τη Ρωσία πάνω από 40%. Συνεπώς η παραοικονομία δεν είναι κάτι στο οποίο διαφέρει σε μεγάλο βαθμό η Ελλάδα. Αλλά ας δούμε τους παράγοντες που συμβάλλουν στη δημιουργία παραοικονομίας. Κατά γενική ομολογία αλλά και τη μελέτη του Αυστριακού Καθηγητή Οικονομικών Friedrich Schneider (Πανεπιστήμιο Λιντζ) που έχει μελετήσει το θέμα επί μακρόν, σημαντική αιτία ή σύμπτωμα είναι ο μεγάλος αριθμός μικρών επιχειρήσεων/επιχειρηματιών. Η Ελλάδα έχει έναν εκπληκτικά υψηλό αριθμό αυτοαπασχολούμενων επαγγελματιών (δικηγόροι, λογιστές, μηχανικοί, γιατροί, καθηγητές, οικιακοί βοηθοί, εργάτες κλπ) καθώς και μεγάλο ποσοστό μικρών εταιρειών. Σχεδόν το 35% του ελληνικού εργατικού δυναμικού είναι αυτοαπασχολούμενο σε σύγκριση με το 7% στις ΗΠΑ. Από την άλλη πλευρά, το 58% των εταιρειών στην Ελλάδα είναι πολύ μικρές (έως 9 εργαζόμενοι) ενώ το αντίστοιχο ποσοστό στην ΕΕ είναι 29%. Είναι γενικά δύσκολο να εισπράττεται φόρος από αυτούς τους δύο τομείς λόγω της πολυδιάσπασης. Ο φόρτος παρακολούθησης είναι πολύ μεγάλος που εν τέλει μπορεί να κοστίζει περισσότερο από το έσοδο που τελικά θα εισπραχθεί. Όμως ο έλεγχος γίνεται σε όλες τις χώρες, τουλάχιστον για παραδειγματισμό και για απόδοση κοινωνικής δικαιοσύνης. Στις ΗΠΑ για παράδειγμα που οι μισθοί των εφοριακών είναι υψηλοί (όπως και θα έπρεπε με βάση τη δουλειά που κάνουν αλλά και για να μην υπάρχουν και πειρασμοί..) γίνονται δειγματοληπτικοί έλεγχοι σε μικρά καταστήματα (και εκεί φοροδιαφεύγουν οι μικρές επιχειρήσεις κι ας κατακρίνουν πολλές φορές οι ομογενείς μόνο την Ελλάδα). Όταν όμως διαπιστωθεί παράβαση τότε τα πρόστιμα είναι ουσιαστικά εξουθενωτικά, ακόμα κι αν δεν εισπραχθούν, κυρίως για λόγους παραδειγματισμού. Εν πάσει περιπτώσει, με βάση την ανάλυση του Schneider μπορούμε να δούμε ότι ενώ η Ελλάδα έχει σχεδόν 35% ποσοστό αυτοαπασχολούμενων παρουσιάζει παραοικονομία 22% (Size and Development of the Shadow Economy of 31 European and 5 other OECD Countries from 2003 to 2015, Friedrich Schneider). Την ίδια στιγμή η Εσθονία με μικρότερο αριθμό αυτοαπασχολούμενων (περίπου 10 και 15%) παρουσιάζουν υψηλότερη παραοικονομία της τάξης του 27%!! Και να σκεφτεί κανείς ότι σε πολλά άρθρα η Εσθονία υμνείται για την μεγάλη πρόοδο στον εκμοντερνισμό της δημόσιας διοίκησης και την ψηφιοποίηση! Προσωπική άποψη του γράφοντα είναι ότι το μεγάλο πρόβλημα δεν είναι η παραοικονομία αλλά ο δυσανάλογα μεγάλος αριθμός μικρών εταιριών αν και οι μικρές επιχειρήσεις είναι ζωτικής σημασίας επειδή δημιουργούν μεγάλο αριθμό θέσεων εργασίας. Από την άλλη πλευρά όμως, σε ανεπτυγμένες χώρες, υπάρχουν πολλές μεγάλες εταιρείες οι οποίες, στο βαθμό που δεν φοροδιαφεύγουν (νόμιμα η παράνομα), μπορούν να παράσχουν τα απαραίτητα κεφάλαια για τη χρηματοδότηση των κρατικών προϋπολογισμών (το 33% των επιχειρήσεων είναι μεγάλες στην ΕΕ (πάνω από 250 εργαζόμενοι ) σε σύγκριση με μόνο το 13% στην Ελλάδα). Εκτός αυτού, οι μεγάλες εταιρείες μπορούν επίσης να επενδύσουν στην έρευνα και στο εργατικό δυναμικό και έτσι να ηγούνται των πολιτικών οικονομικής ανάπτυξης και προόδου κάτι που οι μικρότερες επιχειρήσεις δεν μπορούν, καθώς πολλές μετά βίας επιβιώνουν. Επίσης βοηθητικός παράγοντας για την παραοικονομία είναι και μεγάλος αριθμός συναλλαγών που πραγματοποιούνται σε μετρητά (ξενοδοχεία και εστιατόρια, λιανικό εμπόριο, μεταφορές). Το τελευταίο έχει μειωθεί μετά την εισαγωγή των ελέγχων κεφαλαίου (capital controls) με τους Έλληνες να χρησιμοποιούν σήμερα περισσότερο το πλαστικό χρήμα. Για τον λόγο αυτόν μάλιστα στα πρόσφατα απολογιστικά στοιχεία της Ελληνικής οικονομίας παρουσιάζεται η ιδιωτική δαπάνη να αυξάνεται όταν μειώνεται το εισόδημα και αυτό αποδίδεται στο γεγονός ότι μεγάλο μέρος της παραοικονομίας «φανερώνεται» (δηλ. καταγράφεται πια μέσω της έκδοσης αποδείξεων κλπ). Η διαφθορά στην Ελλάδα είναι ένα μεγάλο θέμα που έχει συζητηθεί υπερβολικά και είναι και από τους συνηθέστερους αποτρεπτικούς παράγοντες όταν πρόκειται για επενδύσεις (μαζί με τη γραφειοκρατία) ειδικά όταν εμπλέκονται χώρες με αυστηρό νομοθετικό πλαίσιο. Στις ΗΠΑ π.χ. υπάρχει νομοθεσία (Foreign Corrupt Practices Act –FCPA) που απαγορεύει στις εταιρίες να προβούν σε δωροδοκίες στο εξωτερικό (εκτός από τις Αμερικανικές εταιρίες καλύπτει και όσες ξένες είναι στα Αμερικανικά χρηματιστήρια και έτσι αποκαλύφθηκε και το σκάνδαλο Siemens το οποίο είναι διεθνές). Ας δούμε, ωστόσο κατά πόσο είναι υπαρκτό πρόβλημα η υπερβολή η διαφθοράς όσο αφορά τις επενδύσεις. Η Ελλάδα έχει καλύτερη κατάταξη όσον αφορά τη διαφθορά (δείκτης CPI) σε σύγκριση με την Κίνα (40), το Μεξικό, το Βιετνάμ (33), τις Φιλιππίνες (35), το Περού (35), το Μπαγκλαντές (26). Παρόλα αυτά οι χώρες αυτές προσελκύουν μεγαλύτερα ποσά Αμέσων Ξένων Επενδύσεων (Foreign Direct Investment, FDI) (βλ. Πίνακα με βάση τα δεδομένα του 2015). Έτσι, εκ πρώτης όψεως, το επιχείρημα ότι η διαφθορά επηρεάζει τις επένδυσες δεν φαίνεται να ευσταθεί σε γενικές γραμμές. Προχωρώντας ένα βήμα παραπέρα, από μια στατιστική επεξεργασία των τιμών του δείκτη CPI και των επενδύσεων (FDI) σε διάφορες χώρες δεν προκύπτει καμία συσχέτιση μεταξύ των δυο. Αν κάποιος γνωρίζει κάτι περισσότερο επί αυτού ο γραφών ενδιαφέρεται να το μάθει. Όμως αν όντως έτσι είναι τα στοιχεία, αυτό επιβεβαιώνει ότι οι επενδυτές μπορούν να κάνουν δουλειές σε διεφθαρμένα κράτη (χωρίς αυτό να σημαίνει ότι αναγκαστικά προχωρούν και σε παρανομίες). Γενικά οι καλοί επενδυτές, αυτοί που επιτυγχάνουν τις καλύτερες επιδόσεις πηγαίνουν εκεί που οι άλλοι είτε δεν τολμούν, είτε αποτυγχάνουν…. Η συζήτηση περί διαφθοράς βλάπτει την φήμη μιας χώρας συνεπώς χρειάζεται προσοχή: Ακόμα κι αν η διαφθορά δεν είναι μεγάλος αποτρεπτικός παράγοντας για τις επενδύσεις, όπως είδαμε και μόνο η συζήτηση δημιουργεί μια αρνητική εικόνα για την Ελληνική οικονομία και τελικά έναν φαύλο κύκλο που οδηγεί σε αυτοεπιβεβαιούμενη προφητεία (δηλ. είμαστε διεφθαρμένη χώρα όπως διαλαλούσε και ένας πολιτικός κατά τις διαπραγματεύσεις για την υπαγωγή στο ΔΝΤ και τα μνημόνιο άρα τι μπορεί να περιμένεις; μας αξίζει η καταστροφή. Έριχνε νερό δηλαδή στο μύλο των δανειστών). Ποιος θέλει να εμφανίζεται ότι συνδέεται με διεφθαρμένες πρακτικές; Κανένας, τουλάχιστον δημόσια. Επομένως, σε αυτά τα ζητήματα, τα ΜΜΕ και ατομικά ο καθένας στα κοινωνικά δίκτυα πρέπει να είναι πολύ προσεκτικά για να μην δίνει λαβές. Οσοι έχουν ζήσει στο εξωτερικό θα ξέρουν ότι άλλες εθνότητες ή μειονότητες κάτι τέτοιο το προσέχουν πολύ και δεν δέχονται δημόσια κριτική (δηλ. «τα εν οίκω μη έν δήμω»). Η δημόσια συζήτηση για τη διαφθορά, ακόμα και όταν υπάρχουν αποδείξεις μπορεί να είναι επικίνδυνη γιατί η κοινή γνώμη συχνά αντιδρά υπερβολικά σε αυτές τις ειδήσεις και αυτό μπορεί να οδηγήσει σε αναταραχή, βία και υστερία (για παράδειγμα σε περιπτώσεις που επηρεάζουν τη δημόσια υγεία αν υπάρξει η φήμη για δηλητηριασμένα τρόφιμα κλπ). Ακόμη και αν ένα κοινωνικό σύστημα είναι νοσηρό, δεν είναι φρόνιμο να κλονίσει κανείς την εμπιστοσύνη του κόσμου και να εξάψει τα συναισθήματα το οποίο μπορεί να οδηγήσει σε ανεξέλεγκτες καταστάσεις πριν προσπαθήσει πρώτα να το διορθώσει. Γενικεύσεις και προπαγάνδα: πόσο δίκαιη είναι η εξαγωγή συμπερασμάτων με γενικεύσεις; Είναι κάτι το οποίο κάνουν κατά κόρο οι δημαγωγοί και το οποίο εμφανίζεται και σε αυτές τις συζητήσεις περί διαφθοράς και γενικά στα αρνητική δημοσιότητα για την Ελλάδα (αυτό η λογική πλάνη λέγεται και association fallacy). Συνήθης μορφή της είναι αν πούμε ότι αφού ο τάδε είναι δημόσιος υπάλληλος και πιάστηκε να δωροδοκείται τότε όλοι οι δημόσιοι υπάλληλοι δωροδοκούνται. Ποιος μπορεί να πει αυτό? Η διαφθορά κατά σύμβαση σχετίζεται με παραβίαση των γραπτών νόμων. Οι νόμοι όμως και η ηθική διαφέρουν από χώρα σε χώρα. Κατά μια ριζοσπαστική προσωπική άποψη επηρεασμένη από την κοινωνιολογία (Hofstede, Weber κ.α.) θα μπορούσαμε να πούμε ότι σε ορισμένες κουλτούρες (συλλογικές/collectivist) οι άγραφοι νόμοι έχουν μεγάλη αξία και σε άλλες (ατομικιστικές/individualist) έχουν μεγαλύτερη αξία οι γραπτοί (τέτοιες είναι π.χ. οι περιπτώσεις βεντέτας όπου κάποιος υπακούει στο άγραφο δίκαιο και όχι στον νόμο). Προσωπικά δεν θέλω να κρίνω ποια είναι καλύτερη κουλτούρα αλλά ποια είναι συμβατική με τα δικά μου πιστεύω και άρα με ποιους θέλω να συναλλάσσομαι ή όχι. Όμως όσο αφορά τη διαφθορά και τις συναλλαγές ο Bill Gates, στο ετήσιο δελτίο του προσωπικού του Φιλανθρωπικού Ιδρύματος Gates Foundation που διαχειρίζεται $38 δισεκατομμύρια δολάρια και επενδύει σε χώρες αναπτυσσόμενες όπως η Αφρική, είπε το 2014: “η διαφθορά δεν είναι τόσο μεγάλο εμπόδιο στην ανάπτυξη όπως οι περισσότεροι πιστεύουν…οι δωροδοκίες είναι σε πολλές περιπτώσεις ένας είδος φόρου επί της επένδυσης”. Ριζοσπαστική άποψη αλλά μπορεί και να συζητηθεί. Σε αυτή την περίπτωση το πρόβλημα πιστεύω είναι κυρίως η διαφάνεια. Τι γίνεται εάν σε μια κοινωνία είναι ηθικά αποδεκτή η προμήθεια(φακελάκι) αλλά αποκρύπτεται από τον κόσμο το ύψος της ή και ακόμα και στο σύνολό της οπότε δεν φορολογείται δημιουργώντας συνθήκες αδικίας και ανισότητας; Και φυσικά ας μη μιλήσουμε για την δωροδοκία πολιτικών. Υπάρχουν και άλλα παραδείγματα διεθνώς αλλά επικεντρώθηκα στην Γερμανία επειδή από εκεί έρχονται τα περισσότερα «μαθήματα ηθικής». Αλλά και πάλι, για να είμαστε δίκαιοι δεν σημαίνει ότι θα πρέπει και εμείς να πάμε στο άλλο άκρο και να υποστηρίξουμε ότι όλο το επιχειρηματικό σύστημα της Γερμανίας είναι διεφθαρμένο. Από μια εκ νέου στατιστική επεξεργασία των Άμεσων Ξένων Επενδύσεων (FDI) και των δεικτών EFI και GCI προκύπτει ότι δεν υπάρχει κάποια σχέση μεταξύ των δύο. Δηλαδή και σε αυτή την περίπτωση μπορεί κάποιοι να παραπονιούνται για γραφειοκρατία και αναποτελεσματικότητα αλλά παρ’όλα αυτά επιχειρούν σε αυτές τις χώρες. Εάν κάποιος έχει διαφορετική γνώμη επί αυτών των στοιχείων ο γραφών θα ήθελε να τη ξέρει. Αν δούμε στον πίνακα η Ελλάδα έχει καλύτερους δείκτες EFI από την Κίνα, το Βιετνάμ και όμως αναλογικά λαμβάνει λιγότερες επενδύσεις. Συνεπώς δεν είναι η γραφειοκρατία και η αποτελεσματικότητα το μόνο θέμα που μετράει. Μια άλλη οπτική στο θέμα αυτό δίνει ο δείκτης Doing Business της Παγκόσμιας Τράπεζας (που μετρά το Επιχειρηματικό Πλαίσιο σε μια χώρα. Κατά αυτόν η Ελλάδα κατατάσσεται στην 67η θέση το 2017 από 60η το 2016. Δηλαδή έπεσε το 2017 παρά τις τόσες διαρθρωτικές μεταρρυθμίσεις που έχει απαιτήσει η Τρόικα και οι διάφορες κυβερνήσεις έχουν υλοποιήσει παίρνοντας τα εύσημα των δανειστών!!!!. Και πάλι δεν έρχονται επενδύσεις! Αυτό και μόνο μπορεί να μας βάλει σε σκέψεις για το κατά πόσο είναι άσχημη η κατάσταση στο θεσμικό πλαίσιο και την διοίκηση και για το αν χρειάζονται εν τέλει πολλές από αυτές οι μεταρρυθμίσεις ή γίνεται για αποπροσανατολισμό ή για εξυπηρέτηση άλλων σκοπών. Τώρα που βρήκαμε παπά, ας θάψουμε πέντε-έξι…. Τα ερώτημα λοιπόν είναι εάν η Ελλάδα προσφέρει κάποια χαρακτηριστικά που προσελκύουν επενδύσεις. Η απάντηση είναι ότι προσφέρει ή μπορεί να προσφέρει σε πολλούς τομείς αν μπορέσει να εκμεταλλευτεί τη θέση της, την υπάρχουσα τεχνογνωσία αλλά και το μορφωμένο εργατικό δυναμικό. Αυτό βέβαια είναι θέμα που απαιτεί μακροσκελή ανάλυση. Το θέμα όμως είναι αν οι παρούσες οικονομικές συνθήκες το επιτρέπουν και εάν υπάρχει βούληση από τους εταίρους της ΕΕ και της Τρόικας και την εγχώρια επιχειρηματικότητα να το υποστηρίξει. Η Ελλάδα επίσης κάνει κάποια βήματα ως προς την προώθηση μεγάλων επενδύσεων με τις διαδικασίες Fast Track. Γνώμη του γράφοντα είναι ότι «το κράτος μπορεί να αποδώσει γρήγορα όπου θέλει και να μπλοκάρει επενδύσεις όπου δεν θέλει. Tο πρώτο μπορεί να εγείρει υποψίες διαφθοράς ενώ το δεύτερο αποδίδεται στην γραφειοκρατία….» Καθένας θα πρέπει να είναι πληροφορημένος και προετοιμασμένος, παράπονα κατόπιν εορτής δεν ωφελούν. Οι άμεσες ξένες επενδύσεις (FIDI) ανήλθαν σε $1,7 δσ το 2014 σύμφωνα με την Παγκόσμια Τράπεζα και $39,5 δις μεταξύ 1990-2015. Οι υψηλότερες επενδύσεις προέρχονται από Ευρωπαϊκές χώρες (Γερμανία, Γαλλία, Ηνωμένο Βασίλειο και Ολλανδία. Η γεωπολιτική και η απόσταση μπορεί να είναι ένας παράγοντας που να ευνοεί τις Ευρωπαϊκές επενδύσεις σε σύγκριση με τις ΗΠΑ που δεν είναι σημαντικός επενδυτής. Τον τελευταίο καιρό, πάντως η Κίνα έχει ξεκινήσει να επενδύσει σε μεγάλο βαθμό στα πλαίσια του νέου δρόμου του μεταξιού (One Belt One Road), της διαδρομής δηλαδή που ακολουθούν τα Κινεζικά προϊόντα για να βρεθούν στη Βόρεια Ευρώπη, στην οποία αναπόσπαστο μέλος είναι η Ελλάδα με το λιμάνι του Πειραιά αυξάνοντας και τη γεωστρατηγική σημασία της Ελλάδας και τη προοπτική εμπορίου. Ο τουρισμός αποδεικνύει ότι είναι δυνατό να προσελκυσθούν επενδύσεις όταν υπάρχει συγκριτικό πλεονέκτημα και προοπτική κέρδους. Πώς να ανταγωνιστεί την Ελλάδα μια χώρα χωρίς ήλιο ότι και να κάνει σε επίπεδο θεσμών; Όμως ο τουρισμός δεν φθάνει γιατί δεν παράγει μεγάλη προστιθέμενη αξία και εν τέλει δεν μπορεί να απορροφήσει πολλούς πτυχιούχους. Ευτυχώς έχει αρχίσει να γίνεται συζήτηση για την παραγωγή στην Ελλάδα και δίκαια. Το θέμα είναι κατά πόσο θα προχωρήσει. Σκεφτείτε πόσοι εισαγωγείς θα ζημιωθούν σε αυτή την περίπτωση. Όμως πρέπει να γίνουν πολλά τόσο όσο αφορά κίνητρα αλλά και ενημέρωση και προβολή (και φυσικά να σταματήσει η αρνητική δημοσιότητα). Το που μπορούν να γίνουν επενδύσεις στο μέλλον και πως είναι ένα αρκετά μεγάλο για να καλυφθεί εδώ (ενδεικτικά παραπάνω (δείτε: SUGGESTED AREAS FOR INVESTMENT IN GREECE) παρατίθενται μια σειρά προτάσεων του γράφοντος όσο αφορά προτεινόμενους τομείς για επενδύσεις στην Ελλάδα ). Σίγουρα θα πρέπει να εξεταστεί η δραστηριοποίηση στη βιομηχανία και σε τομείς υψηλής προστιθέμενης αξίας χτίζοντας σε υπάρχουσες δυνατότητες αλλά και ακολουθώντας τις μελλοντικές τάσεις. Και φυσικά θα πρέπει να προστατευτεί η αγροτική παραγωγή στο βαθμό που τουλάχιστον εξασφαλίζει την διατροφική επάρκεια. Είναι απαράδεκτο να εκβιαζόμαστε στη λήψη αποφάσεων με βάση το γεγονός του ότι πρέπει να εισάγουμε βασικά είδη διατροφής! Για την ώρα ελπίζω να παρείχα κάποια στοιχεία για προβληματισμό όσο αφορά την αρνητική δημοσιότητα ώστε να αντιμετωπιστεί η κατάρα και η μειοδοσίας της δυσφήμησης. Το άρθρο αυτό βασίστηκε σε δημοσιευμένα στοιχεία και επεξεργασία από τον γράφοντα. Το κείμενο αυτό γράφτηκε στα Αγγλικά και μεταφράστηκε ή μεταφέρθηκε στα Ελληνικά (κατά το δυνατό καλύτερα αλλά όχι πιστά) με κάποιες παραλλαγές. Το Transatlantic Business Forum δεν μπορεί να θεωρηθεί ότι συμμερίζεται τις απόψεις των άρθρων που φιλοξενεί. This entry was posted in Economic Policy, M&A Markets. Bookmark the permalink. This is a well-researched, fact-based article, and it should be required reading for all those who would like to know what the real deal on modern Greece is. Unfortunately, many people in the business world, and in general, are ineluctably exposed to (and perhaps influenced by) pieces written by journalists who –whether unwillingly or purposely– perpetuate false national prejudices and fatuous cultural stereotypes. Mr Chatziplis’s in-depth analysis paints an objective picture about the current situation in Greece, as far as all the relevant socio-economic areas are concerned, and does not pull any punches whenever need be. Kudos to Mr Chatziplis.